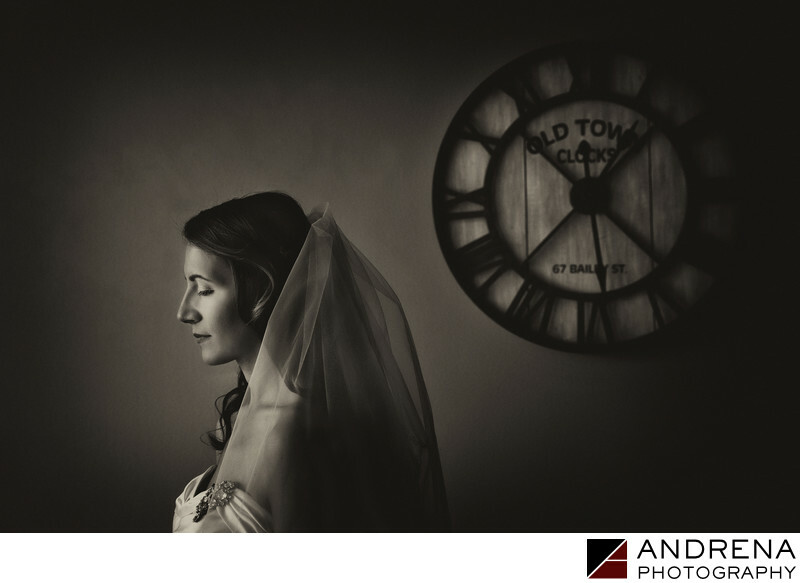 Most photographers agree that having a wide open, well-lit, clutter-free space for the bride's getting ready preparations results in some of he very best photographs. But such locations are not always available. For this wedding, the bride got ready at a friend's condo near her church. The condo was jam-packed with makeup artists, bridesmaids, furniture, toys and her friend's baby. So there was very little room to work within. Still, I saw this clock art on the wall, and knew I could create a lovely portrait with it. The original is color and is very light, bright and airy in tone. But I thought that a dark, moody warm-tone black and white would help create a different ambiance for this image. The use of B&W gives this image a stillness that was not present in the color version. Catholic wedding photographed at St. Monica's Church in Santa Monica, and Verandas in Manhattan Beach.